“E-book backup è una copia fisica, tangibile, leggibile dall’uomo di un romanzo in formato digitale. I contenuti acquisiti dall’e-book reader sono stati facilmente fotocopiati e tenuti insieme da una clip per creare un backup solido e adatto alla mia libreria, per me che sono un consumatore di libri. Posso conservarlo nella mia libreria senza paura di dimenticare di averlo lì. Un secondo backup dotato di copertina rigida è stato fatto con l’aiuto di un piccolo editore online. 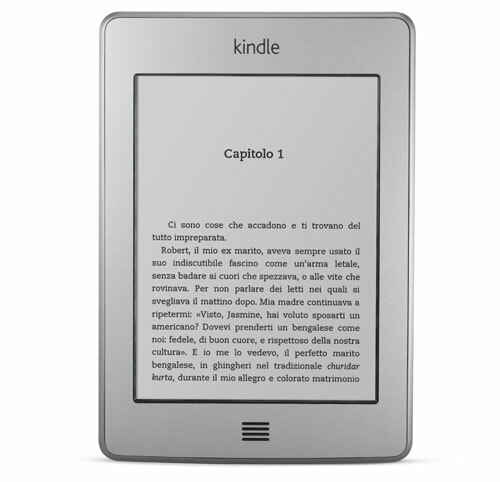 Nel 2009 alcuni utenti Amazon Kindle si ritrovarono con le loro copie di 1984 e La fattoria degli animali di George Orwell rimosse dal loro e-reader, senza essere né avvertiti e senza che gli venisse richiesto il consenso; queste particolari copie erano state offerte scontate da un’editore che non aveva i diritti per farlo. Dopo le lamentele dei consumatori per la sparizione degli ebook da loro acquistati, Amazon ripristinò le copie eliminate per quelli che avevano acquistato il libro, o offrì delle gift cards per compensare l’inconveniente, promettendo che non si sarebbe più ripetuto qualcosa del genere in futuro. Cambiamenti insidiosi nella cultura avvengono spesso in maniera abbastanza lenta. Tutti i content provider saranno così gentili e prodighi di scuse in futuro, quando la maggioranza dei contenuti potrà essere controllata dall’alto? Le videocassette, nei loro giorni di maggior successo, erano totalmente controllate da chi le acquistava. Sono state soppiantate dai DVR, che ultimamente rispondono ai content provider, i quali decidono cosa il consumatore può o non può registrare. Ancora più seccanti sono i provider di video on-demand, che ritirano i contenuti video secondo i capricci dei detentori dei diritti, sulla scia di fusioni societarie o azioni legali. Diffido da tendenze di questo tipo che nel tempo si stanno presentando nel regno degli e-book. fonte: E-Book backup : Jesse England. 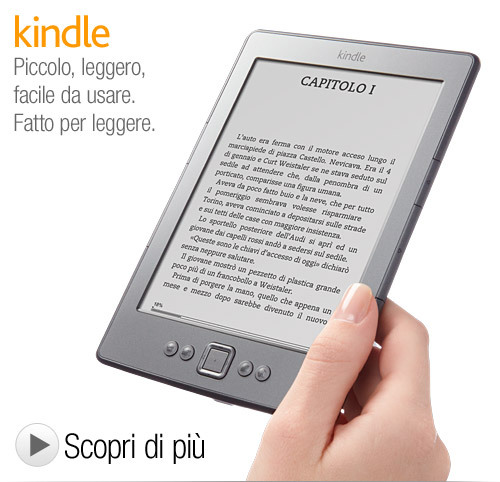 Kindle’s Promotional References – Silvio Lorusso/Blog. Carrellata di testi visualizzati nelle immagini pubblicitarie dell’ebook reader Kindle. Books are changing, and the nature of reading, what we take away from it, is changing too. Books used to be physically malleable things that we marked, physically, with our experiences: dog-earing them, underlining them, highlighting, and copying out. But the books will not be physical for very much longer. The great misunderstanding of digitization is to believe that it is only the content and the appearance that matters. That, to reproduce the experience of the book, we needed to make a screen that looked like a page, that turned like a page, that contained words. And the reason that we’ve had difficulty for so long with the notion of eBooks is that that is not all that books are. Books are journeys, and encoded experiences. The writer has spent months, perhaps years, producing this work out of themselves. That devastating last line of James Joyce’s Ulysses: ‘Trieste – Zurich – Paris 1914 – 1921.’ And the book is the medium of transmission of that experience, so that the reader, too, can experience it, and go on their own journey. The books are subliming, they are going up into the air, and what will remain of them is our experiences. That experience is encoded in marginalia, in memory, and in data, and it will be shared because we are all connected now, and because sharing is a form of communal prosthetic memory. When Walter Benjamin wrote that ‘what shrinks in an age where the work of art can be reproduced by technological means is its aura’, he was assuming that the aura diffused, that it was lost to the other reproductions. But digital technologies do not just disseminate, they recombine, and in this reunification of our reading experiences is the future of the book. The Unbound Book Conference, May 20, Den Haag. With the intention to test and eventually adopt open standards for the ToD project, we made some experiments on EPUB. In order to understand clearly how this format works, we developed a publications’ catalogue using Sigil. This software includes both a code editor and a WYSIWYG one, which has useful formatting tools (such as bold, italic, indents, text-alignment, lists), but it doesn’t have a button to create links.